OK...I've gotten a lot of great pictures from you guys of your "first" cookies. Let me say, I am amazed! You all are so talented!!! When we moved recently, I came across some old pictures of MY first cookies. It's taken me 5 months to work up the nerve to show you. Really? They are pretty scary! See, I knew royal icing was involved, but I didn't know anything about flooding cookies. (That came later, thanks to Martha.) I just smeared it on the cookie...and not very well at that. 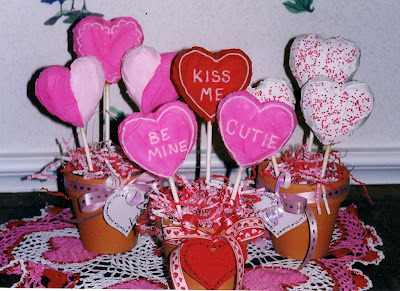 I obviously had a thing for bouquets (and two-tone hearts?). 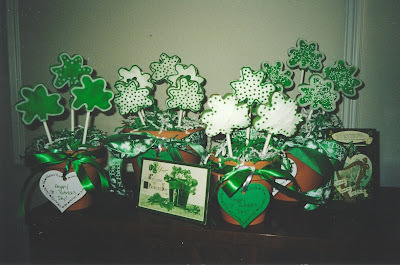 Seeing these pictures brought back terrible memories of running around finding Styrofoam balls, matching paper shred and hot gluing the ribbon to the pots so it wouldn't slip off. I personally apologize to anyone who received these cookies! I definitely have more to learn...maybe someday my cookies will look like this or this. A girl can dream, can't she? Hope you'll come along for the ride and learn along with me! Alright...humor me and go look at some prettier ones now, please! I am so glad to see these pictures! It makes me feel better. I have cookie dough in the fridge, and I am going to work on my "first" real attempt this weekend. Do you have a favorite sugar cookie recipe? 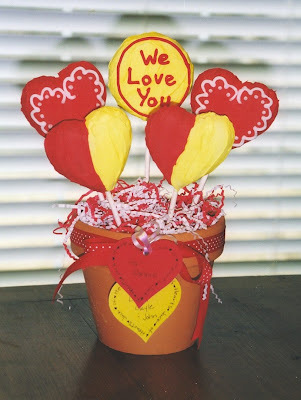 I can't wait to see what I can come up with, I am thinking maybe the cookie bouquet would be nice for mother's day. seriously, those would look like masterpieces compared to anything i could come up with. what i want to know is all the basic items and utensils you would have to say you needed to start doing this? like what would be in your armory if you could start all over again, knowing everything you know now?? Okay now you are making me feel better...if my first turn out as good as your first and end up as good as yours now...there is hope for me! Oh Yippy!!! Thank you for sharing! tonya...look under the posts labled "livestrong." You'll find the recipe I use the most. I could never post my FIRST cookies....they were terrible! I think they are GREAT :) I need to attempt cookie art sometime!! My first decorated cookies were not very good at all. When I started baking for people, I was more interested in doing lemon bars, mini cheesecakes, wedding cookies, things like that. Most of my orders ended up being for decorated cookies. Not good. The cookies were okay and customers seemed satisfied, but that was not my specialty and I am a perfectionist. I have become a much better decorator the last couple of years. Thank you for blogging all of your tips because those have helped so much. These are great! I remember these! Glad you posted them! Your blog is like a MAGIC WAND OF HELP AND INSPIRATION!!! These make feel so much better! I'm not sure if you see new comments on these old posts, but I'm new to your blog and I've been in heaven looking at your beautiful creations and dreaming. I finally took your advice to "just do it" and my cookies weren't bad, but I'm not sure I want anybody else to see them. Thank you for posting these. They are adorable. I'm so excited to put all of your advice to work when I make cookies with my daughter after Christmas.